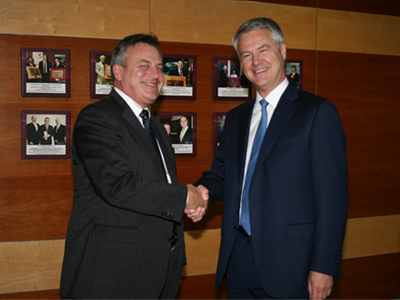 Chief Defence Scientist Dr Alex Zelinsky with Professor Vernon Gibson, Chief Scientific Advisor, UK Ministry of Defence. Australia's cooperation with its allies and regional partners is an important element of the country's defence science and technology (S&T) capability. DST's international engagement is critical for conducting world class research. By undertaking collaborative research with allied countries, especially in niche areas, Australia (through DST) is able to access overseas capabilities that would not otherwise be available to the Australian Defence Force (ADF). DST has strong multilateral relationships through The Technical Cooperation Program (TTCP) with the United States, Canada, United Kingdom and New Zealand. DST’s S&T bilateral relations remain strong with Australia’s traditional partners of USA, UK, Canada and New Zealand, due to historical ties and similar strategic objectives. We have mature S&T bilateral relationship with European countries such as France, the Netherlands and Sweden. These relationships focus on sharing S&T of mutual interest and benefit. DST has continued to develop and foster regional S&T bilateral relationships in the Asian arena, with Singapore, Japan and the Republic of Korea to provide opportunities to collaborate in niche technology areas. The Chemical, Biological and Radiological (CBR) Memorandum of Understanding (MOU) is an agreement between the United States, United Kingdom, Canada and Australia to enable warfighters to prevent, protect against and respond to global CBR threats in any environment or mission. DST Group fosters a close partnership with the UK Defence Science and Technology Laboratory (Dstl), including the exchange of senior staff and sharing of research facilities. DST Group sponsors the Fulbright Distinguished Chair in Advanced Science and Technology, which brings senior United States researchers to Australia on a four to five month appointment at DST or another research institution in Australia linked to DST. DST Group and the US Air Force Research Laboratory (AFRL) are collaborating on the Hypersonic International Flight Research Experimentation (HIFiRE) program. The Technical Cooperation Program (TTCP) is a collaborative five-nation program between UK, USA, Canada, Australia and New Zealand. Australia and the United Kingdom have signed a Memorandum of Understanding (MOU) concerning national security and counter-terrorism cooperative science and innovation. On 17 May 2006, a Memorandum of Understanding (MOU) was signed between the Australian Government Department of the Prime Minister and Cabinet and the United States Combating Terrorism Technical Support Office (CTTSO) housed in the Department of Defense. Australia and the United States of America signed a treaty on cooperation in science and technology (S&T) for domestic security on 21 December 2005.